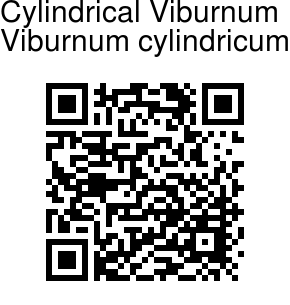 Cylindrical Viburnum is an evergreen large shrub, with young branches and inflorescence hairy. Leaves are 5-13 x 2.5-6 cm, oblong or elliptic, pointed, entire, hairless or inprominently hairy underneath, leathery, persistent; main lateral nerves 3-4 pairs, curving and anastomosing before reaching the margin. Flowers are borne in stalked, 4-umbellate corymbs without bracts. Flowers are about 3 mm, bracteolate; bracteoles woolly, falling off. Calyx is minute, about 1 mm, sepals obsolete. Flowers are tubular, almost cylindrical in appearance, broader at the mouth; petals short, erect. Anthers are oblong. Drupe is 4.5-6 mm long, slightly compressed, black, edible. 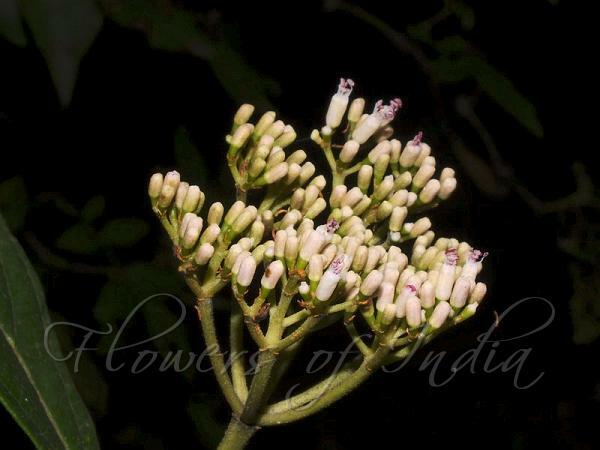 Cylindrical Viburnum is found in the Himalayas, from Kumaun to NE India, at altitudes of 1200-2500 m, Western Ghats, Ceylon, Burma, Thailand, Indo-China, W. China, Malaysia. Flowering: July-September. Identification credit: Nidhan Singh Photographed in Chakrata & Gori valley, Uttarakhand.